IIM Lucknow: SPICMACAY IIM Lucknow chapter organised its sixth event in this year on 28th Jan’2011- ‘Pandavani’ by Teejan Bai. Pandavani (lit. : Songs of Pandavas) is a folk singing style of musical narration of tales from ancient epic Mahabharata with Bhima as the hero. The rendition is accompanied by musical instruments. This form of folk theatre is popular in the Indian State of Chattisgarh and in the neighbouring tribal areas of Orissa and Andhra Pradesh. 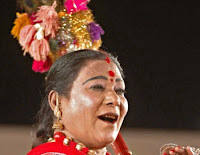 Teejan Bai began the evening on a light note by enlightening the IIML fraternity about ‘Pandavani’ and its origination. 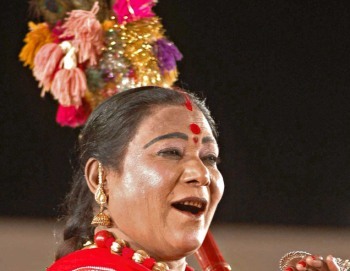 She enacted the very famous Draupadi Cheerharan. The voice modulation, changes in body language and expressions to depict the contrasting characters of Draupadi, Shakuni, Duryodhan, etc are worth mentioning. The light humour sprinkled by her at times with reference to the modern ways of life added to the entertainment. Tags # Aditya Gupta # U.P.